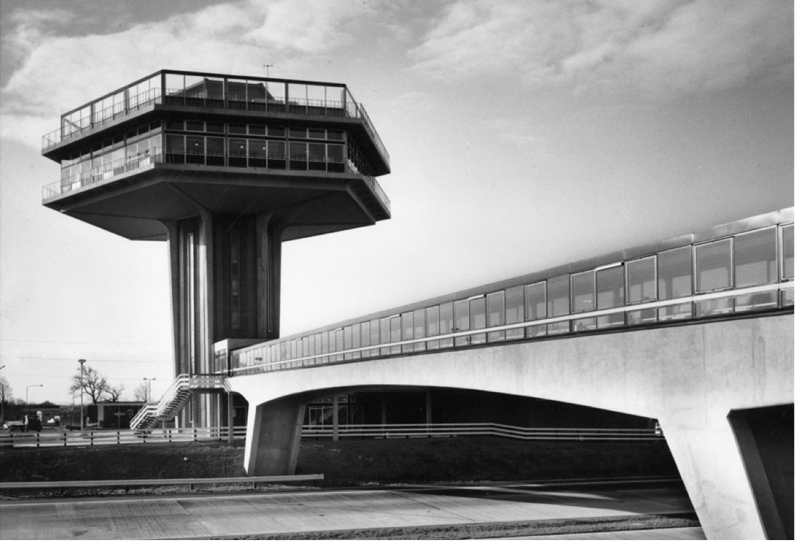 This is Forton services on the M6 motorway (highway) in the North of England. It always makes me smile. It has an hexagonal concrete tower (grade II listed in 2012 according to Wikipedia). This was designed to look like an air traffic control tower originally housing an up market restaurant and sun deck with views to Morecambe bay. It reminds me of a space ship or a 1960’s vision of what a space station might look like. From the train line on the other side of the motorway it even looks like it’s flying. The building is in a bad state of disrepair. It’s suffering from some serious disrepair and under investment. The restaurant at the top tower has been closed for years and the building has suffered from ugly extensions and high street signage (the standard M&S, Greggs and Costa coffee frontage you’d expect to see at any service station). The design of this building has no real purpose apart from saying, why not? This is important in design. You have to be able to ask ‘why not’ questions. Why can’t a service station look like an air traffic control tower or a space ship? Design is always an opportunity to bring a little bit of joy to the world when there is none. It’s an opportunity to make someone smile. A place to celebrate just how how wonderfully silly and brilliant the world can be at the same time. The M6 motorway is not a joyous place. This iconic crumbling building just after junction 34 doesn’t get in my way, but it makes me remember that way back someone was deliberate and had a bold vision. They were designing something. Joy is found in the detail of application in design and then the experience this creates. 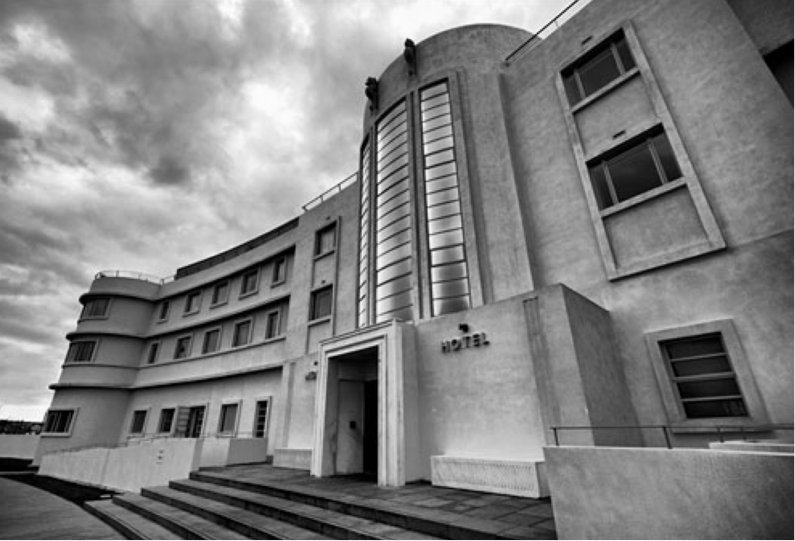 This is why I love art deco buildings like the now restored Midland Hotel a few miles down the road from Forton services in the almost forgotten seaside town of Morecambe. Art deco has a foot print. It has a quality of design and detail that runs through everything, from the exterior stone work of the building to the engravings, decor and furniture that define the grand interiors. Everything is designed to position the experience around you. It’s full of small details, or small moments of joy. Bringing small moments of joy into the world isn’t frivolous. It’s attention to detail. It’s being deliberate about design. Why shouldn’t we care this much about the design of every detail? As designers we have the opportunity to be deliberate about how we design every single footprint that we make in the world. I worry about the consistency or uniformity that the modern world demands from us. We confuse consistency with a lack of creativity, substituting brand engagement for real ideas. This leads to a lack of bold vision. A lack of progress, and failing to ask better questions. Introducing joy can unlock the imagination we need to solve some of the most difficult design challenges in society. It’s learning to enjoy the size of the problem. Small moments of joy in design are capable of reminding us of what else might be possible. Design can be a welcome distraction giving us a welcome perspective on our own lives and everything else that’s happening around us. It can give us new focus or distract us long enough to change how we think about the world, even just for a few minutes or seconds. Design is a good idea because it can introduce small moments of joy into the world. Experience is about emotions, and we’re designing for experience. If a service station on the M6 motorway can be as a space ship then what else it is possible to create?